Russian teacher and Hebrew poet; born at Trishki, government of Kovno, in 1826; died at Riga June 14, 1888; pupil of M. A. Ginzburg. Kaplan was an able educator, and his school at Riga became the model for all the Jewish educational establishments in Russia. He was an indefatigable communal worker and was the very soul of the Progressive congregation of Riga, to which he acted as secretary until his death. To Kaplan's intervention with Count Shuvalov in 1864 was due the liberal treatment by the authoritiesof the Lithuanian Jews residing at Riga, who had thitherto been persecuted by the Germans. Kaplan carried on a correspondence with the eminent Russian publicist Katkov, whom he persuaded to undertake the defense of the Jews in the Russian paper "Russkiya Vyedomosti." 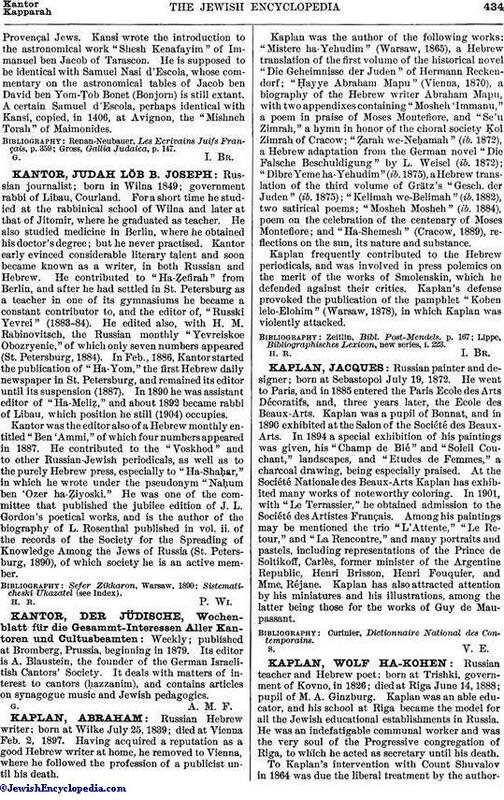 Kaplan was an able Hebrew writer and contributed regularly to the Hebrew periodicals. The most noteworthy of his contributions was "Ereẓ ha-Pela'ot," a poetical vision in 124 six-lined strophes with a prologue, published in the "Keneset Yisrael," ii. (1887). Kaplan is known in the Hebrew press under the anagram . Kaplan maintained a correspondence with the Maskilim of his time, and especially with Leon Gordon. 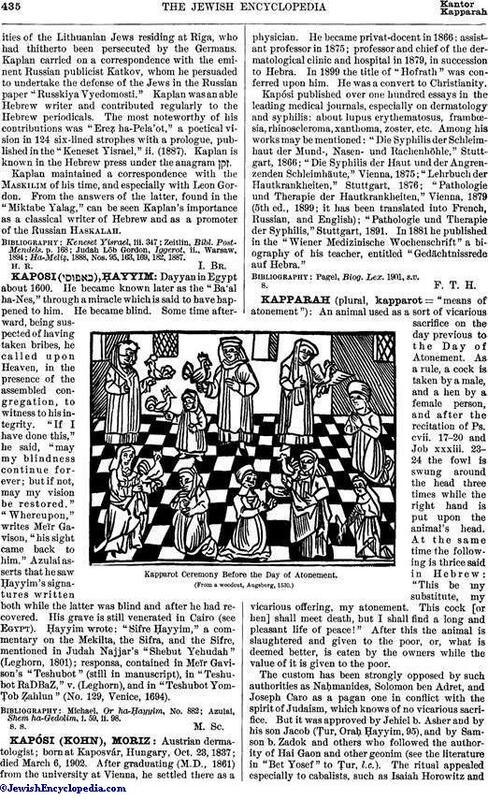 From the answers of the latter, found in the "Miktabe Yalag," can be seen Kaplan's importance as a classical writer of Hebrew and as a promoter of the Russian Haskalah. Ha-Meliẓ, 1888, Nos. 95, 163, 169, 182, 1887.